Go on, live the dream!! Winning Ways Racing provides racing enthusiasts with an opportunity to experience the thrill of racehorse ownership by joining one of our professionally managed Irish national hunt syndicates. Winning Ways identify like minded individuals and form a syndicate which will buy a quality young national hunt horse costing between €20,000 and €25,000. The Winning Ways Team aims to provide a personal and professional service with an emphasis on regular communication and stable visits which is the key to your successful enjoyment of a Winning Ways syndicate, at a fraction of the cost of sole ownership. In a relatively short space of time, the Winning Ways Team has gained impressive experience and success in the field of racehorse ownership through Champion Hurdle winner Brave Inca and multiple winners Kimberlite King (pictured on right with delighted winning connections) and Raise The Beat. We believe our previous experience in racehorse ownership and syndicate management provides us with the insight required to ensure you enjoy your syndicate experience with us. Winning Ways has established a very strong relationship with Colm Murphy and our policy is to acquire quality young horses at the premier Irish national hunt sales. Winning Ways syndicates normally have 10 members and, after the initial purchase price of circa €2,900 per share (which includes VAT and insurance), costs each member around €50 per week. Smaller syndicates can be also be accomodated on request. At Winning Ways we can’t guarantee you a winner at the Cheltenham Festival, but we can guarantee that you will be part of a professionally managed syndicate that will maximise the enjoyment and thrill of racehorse ownership for you, while you live the dream! If you would like to learn more about Winning Ways and what we can offer you, then click here. Winning Ways Racing is a registered business name with company number 346166B and a registered address at 31 Mount Eagle Rise, Leopardstown, Dublin 18. Winning Ways Racing is a member of the Association of Irish Racehorse Owners. Successful owners at Winning Ways Racing!! Raise The Beat - dual bumper winner with his lucky owners. 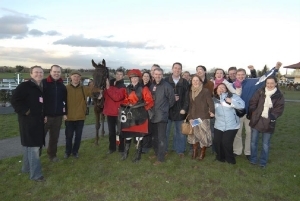 The syndicate travelled to Cheltenham with their horse in March 2011. If you want to live the dream, join one of our syndicates today.